Cliveden ən, also known as the Benjamin Chew House, is a historic mansion in Germantown, Philadelphia, Pennsylvania. 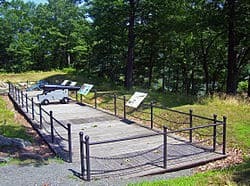 It was the scene of some of the bloodiest fighting of the Battle of Germantown, fought in 1777 during the American Revolutionary War. 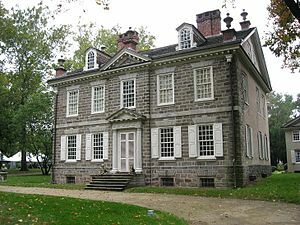 Built between 1763 to 1767, by Benjamin Chew, Esq, the mansion was inhabited from colonial times by seven generations of the Chew family, until 1972. Benjamin Chew was head of the Pennsylvania Judiciary System under both Colony and Commonwealth, and Chief Justice of the Supreme Court of the Province of Pennsylvania. From his legal mentor, Andrew Hamilton, Esq, Chew inherited his lifelong clients, the descendants of William Penn. 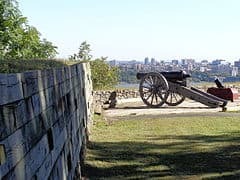 For his own safety, the Executive Committee of the Continental Congress forcibly removed Chew and his family from Cliveden, as his close personal friend, George Washington, was ordering his troops to move towards Philadelphia. British Colonel Musgrave then quickly occupied the sturdily-built mansion and fought off the attack from inside the house with muskets and bayonets. Washington’s army was repelled and sent back down Germantown Avenue in defeat. The original estate included a number of other structures, including a stable and coach house, a smoke house, hen house and summer house. The landscaping features statuary and gardens with over 200 varieties of trees and scrubs. In 1868, a two-story addition was added in the original courtyard. A window on the second floor stair landing in the main house was converted into a hidden doorway to create an entrance to the addition. 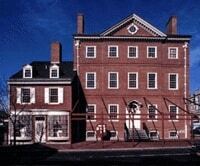 The Chew Family Papers, containing an extensive collection of correspondence, documents, financial records and other materials, are available for research use at the Historical Society of Pennsylvania.